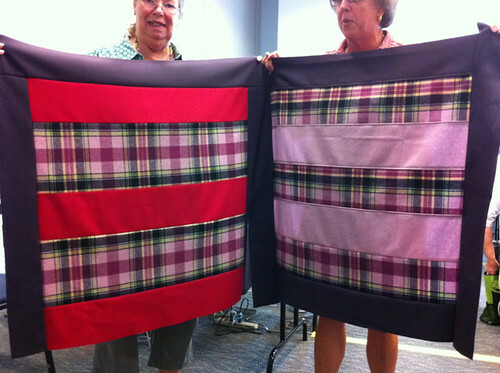 First, a super thrilling Quilts for Quake Survivors update! After beautiful contributions from many, many generous quilters jumping in to quilt and bind as the last leg of our collective bee, Daniela has been tirelessly taking photos of the gorgeous finished quilts. 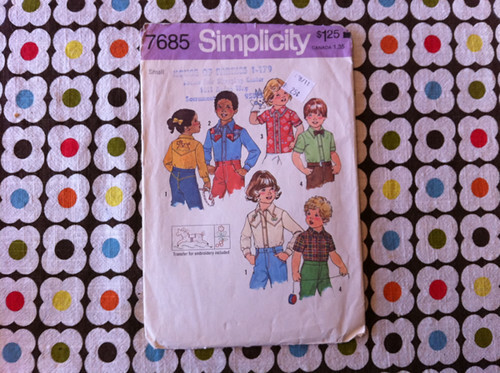 email us at quiltsforquakesurvivors@gmail.com with a copy of your receipt, and the number of the quilt you want to buy! We will ship it to you via USPS with our deep gratitude. 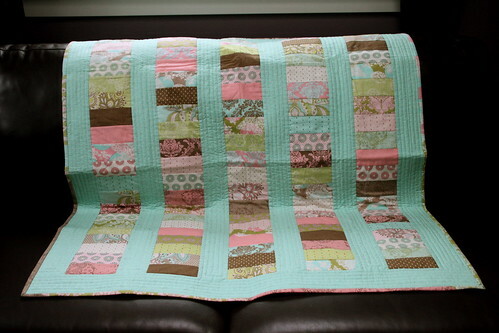 Special thanks to Nancy, who not only donated the lovely quilt top for Pretty in Aqua (below) but also bought it AND Lawn Chair (above), generously supporting Mercy Corps’ crucial work in Somalia. Thank you Nancy!!! 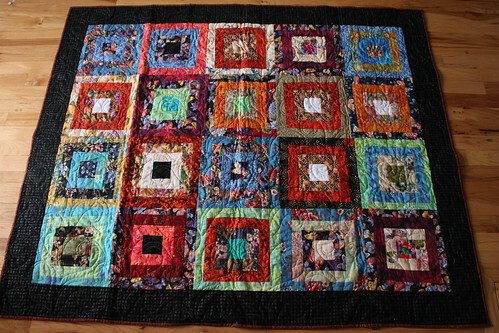 And thank you Daniela for the luminous quilt photographs. 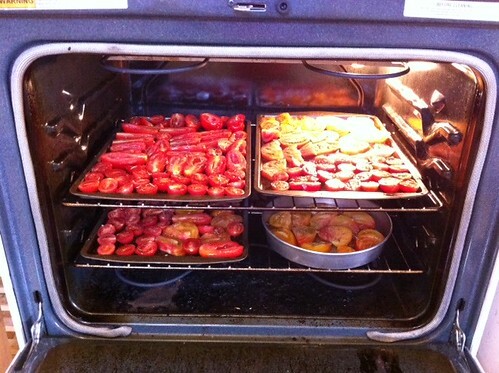 Back to my house, I slow-roasted another 10 pounds of tomatoes from our garden and really wished I had one more oven rack. Wow, those are amazing (and so easy – I followed the recipe I linked, but with herbs of provence instead of coriander, which I don’t like). 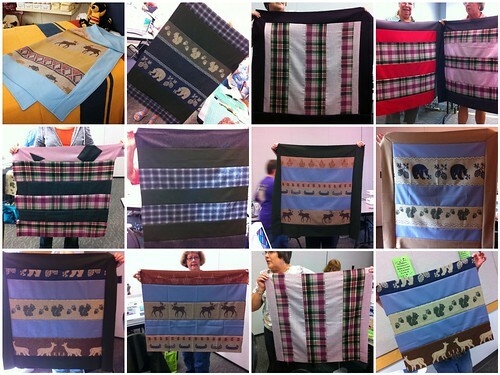 and here are just a few of the quilt tops people made with the beautiful wool colors and patterns. 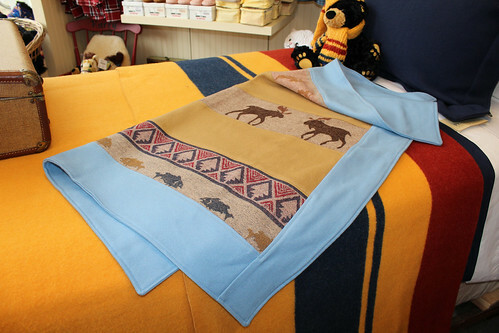 I loved how individual everyone’s projects were – whether they were meant for a grandchild, a wall hanging, or a car quilt for chilly months. It was super fun and I am excited to teach the class again at the Woolen Mill Store on Saturday (October 1 from 1-3:30, $40 includes all fabrics you need, and 2.5 hours means you should walk out the door with a finished quilt!). Speaking of the WMS, their amazing 30-80% off sale goes through Friday and I am so excited to buy some good things there tomorrow. Then we drove down to Oregon City with Pearl and Everett for a (half) day trip. It was beautiful, a perfect late-summer-early-fall day on the river, and I took a bunch of photos. 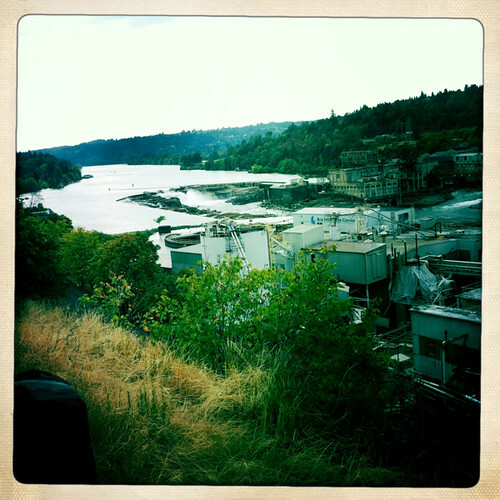 I think Oregon City deserves its own post but for now I’ll just share this one of the Willamette River from the bluff over the old Blue Heron mill, and this Western shirt pattern I bought at the library used-book sale for Everett. Can’t wait to sew this one. 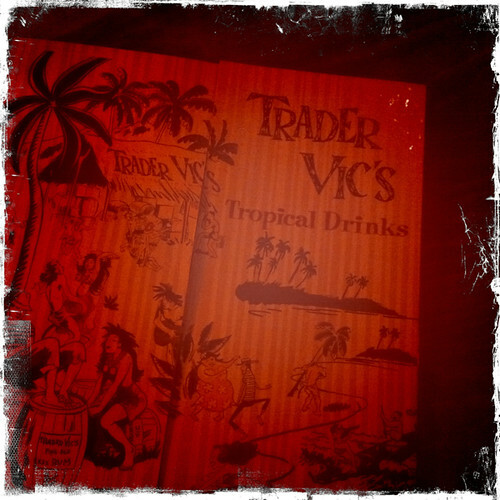 On Sunday Andrew and I got a babysitter and I wore my favorite vintage Lilly Pulitzer dress out to the new Trader Vic’s! 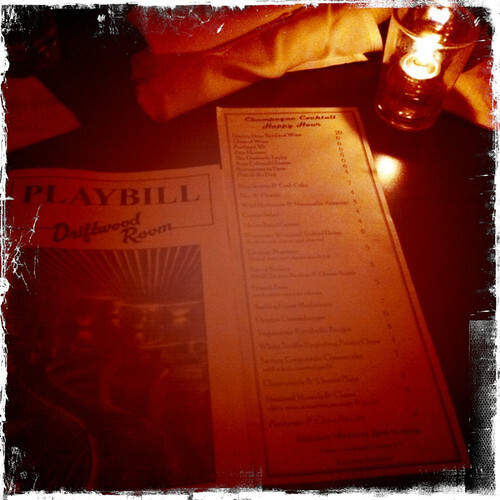 I can highly recommend the 1944 mai tai (they also make a virgin version if you don’t drink) – it’s divine. We also got crab rangoon and fried shrimp and it was pretty killer all the way around. 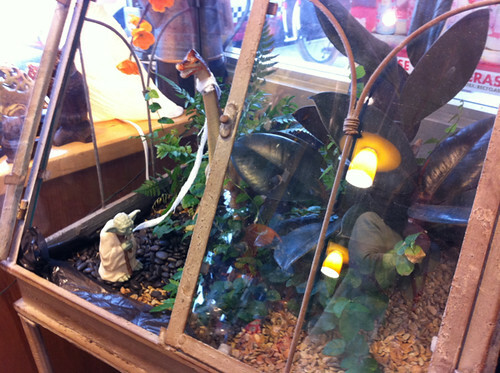 I spotted this truly amazing Yoda-dinosaur terrarium at Powell’s for Cooks and Gardeners on Hawthorne (I was buying The Complete Book of Small-Batch Preserving for my Food In Jars class coming up, I can’t wait!) and got to talk to Megan and her co-workers about it. It’s so awesome! I wrote it up for Geekcrafts today, if you are also fascinated by this convergence of so many good things at once. 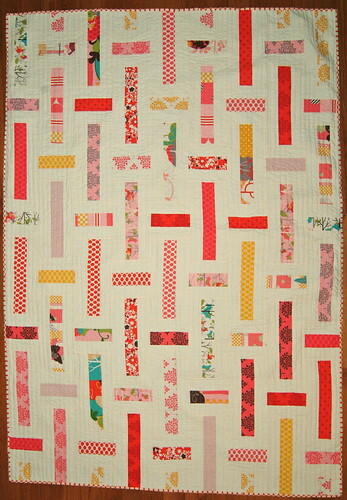 And to come full circle right back to quilts, here is my Habitat challenge quilt block. 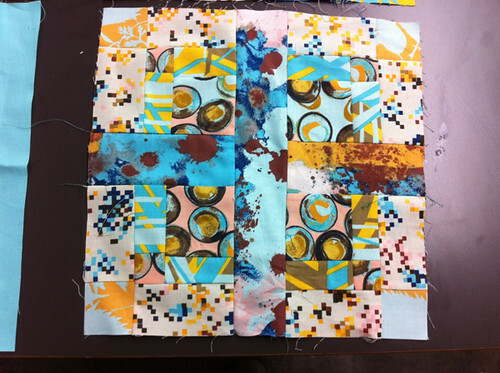 I’m not completely happy with it, to be honest, but I think it will look really cool in our PMQG collective quilt pieced in with everyone else’s blocks (which I liked better!). I wanted to take the “challenge” part seriously and push myself to use just the prints given. Solids were allowed, but that’s so my default that I thought I’d make myself do something different, even if it kind of overwhelmed my eyes. 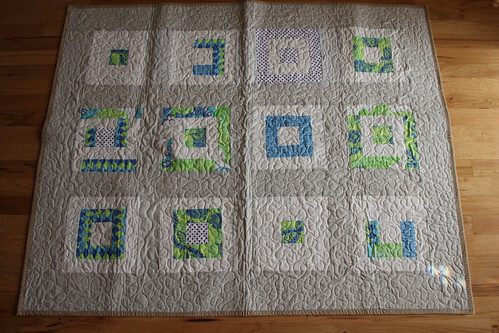 I used Christina’s excellent double disappearing 9-patch tutorial for the four mini-blocks at the corners, and then added the necessary width and height to bring it to 12.5″ with an impromptu 2.5″ cross in the center. 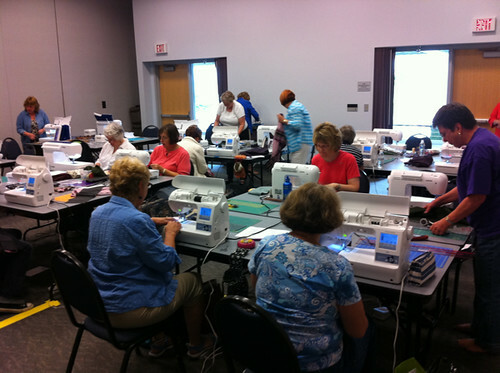 Then I turned off the sewing machine, unplugged the iron, and ran out the door to the meeting! this sitе, it includes helpful Information.